The bathrooms in your home and all that’s contained within them are some of the most frequently used amenities that we rely on from day to day. Your tub and toilet, sink and any other fixture housed in this room face the wear and tear of daily use, not to mention the comings and goings of everyone living in your home. Simply put: after years of constant use, you’re likely going to need expert repair, restoration and remodeling services to maintain your bathroom’s appearance! 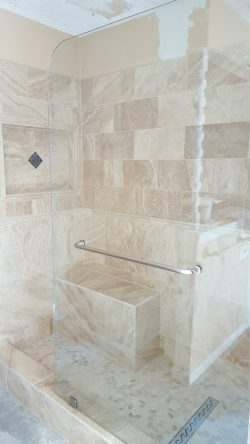 Since 1979, A-1 Shower Repair has been the premier source for all of your bathroom remodeling needs in Houston, TX. From simple shower services, to more complex renovations, we’ve established a reputation for quality work that’s unmatched within the industry. We can install custom tile or glass enclosures to make your old bathroom into a modern work of art or create handicap accessible amenities for elderly independent living situations—no matter what your needs are, we’re equipped to make them a reality. Aside from full remodeling jobs, A-1 Shower Repair also provides singular services, including tub refurbishing, sink repair and retrofitting, shower services and toilet installation in Houston, TX. We offer free estimates on all of our work and come backed by longstanding A-plus ratings from the Better Business Bureau and Angie’s List. Whether your run-down bathroom is in need of a complete facelift or you’re seeking to upgrade a single component for better functionality and aesthetic, A-1 Shower Repair is here to ensure that you’ll fall in love with the finished product. Our workmanship and honest service have been trusted by Texas residents for over 38 years and we’re always ready to prove ourselves to brand new customers. Call us today at 713-947-7457 for a free estimate on bathroom renovations in Harris County or the surrounding area, up to 75 miles. Shower Renovations, Shower Repair, Bathroom Remodeling, Bathroom Remodeler, Shower Refinishing, Bathtub Installation, Sink Installation, Shower Door Replacement, Custom Bathrooms, Bathroom Remodel and much more.